Blue Jay on the branch of tree. Blue Jay (Cyanocitta cristata) can be easier to see for peoples who live in the eastern and central United States and southern Canada. With and adaptation to the live among peoples population this bird don’t have much problems to survive until today – they also choose to stay near residential areas sometimes. Blue jay has a great blue in color with a remarkable blue crest with a white chest and underparts. With some black color that form U-shaped around its neck, on their wings and the bright white color in mixing. Both male and female have the same plumage – in this case usually the male will have shinier plumage than the female. Their sizes can get to 22 – 30 cm (9 – 12 in) from bill to tail and weighs 70 – 100 grams (2.5 – 3.5 oz) and the wingspan of 34 – 43 cm (13 – 17 in) wide. That’s pretty big for a bird actually. So in the ecosystem they can be both the predator and the prey at the same time. They can be a predator for other small birds while they also become a prey for an eagle. 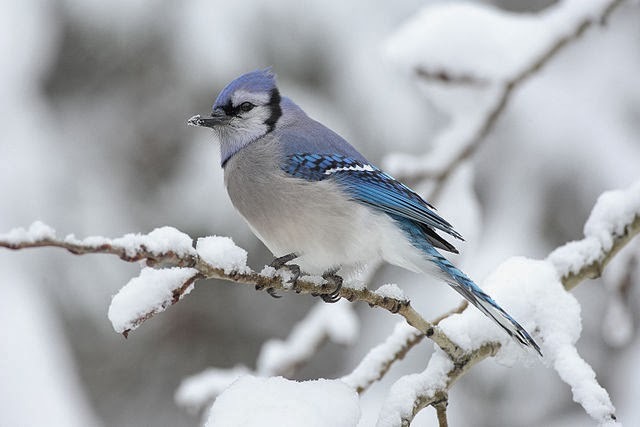 Blue Jay during the winter. They’re many types of Blue Jay across the United States and they’re also migrating between north and south. Anyway their migrating is not persistent each year. So they will migrating or not are up to them. 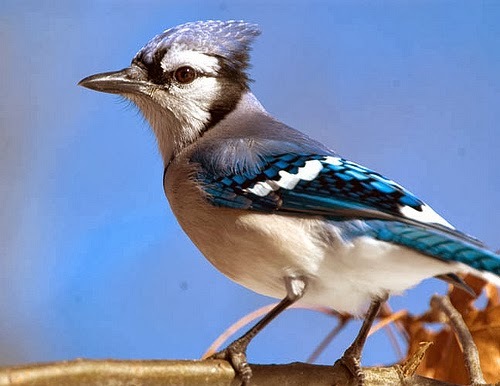 Some of the types of Blue Jays are northern Blue Jay, coastal Blue Jay, interior Blue Jay and Florida Blue Jay. Most significant different between types is sizes. Blue Jay’s diets are varies from fruits and nuts to insects and even other small birds. They also have different calls with loud sounds with capability to imitate other birds call such as hawk. This ability is used whether to check on if there’s another hawk around or scaring other birds for foods – pretty clever! When it comes to parenting issues, Blue Jay will choose the same mate for their entire life, so both of them will work together for their nest. As many other birds that live among peoples population, Blue Jay also can make their nest almost anywhere they find safe – this can be in abandoned mailbox too. Even though Blue Jay is considered as a common bird they still looks attractive for most of peoples.